Use Windows 10 IoT Core to drive a 4 digits LED Tube with 74HC595 chip. One of the common used LED Tube driver chip is 74HC595, by using the Chip, you can save GPIO ports. I bought a LED Tube with 595 chip, it only need 3 GPIO ports to display 4 digits. However there is no existing posts about how to drive the 74HC595 LED Tube from Windows 10. So I can only try for myself. VCC to DC3.3 power, GND to Ground, DIO to GPIO27 (you can change it, and change the program also). 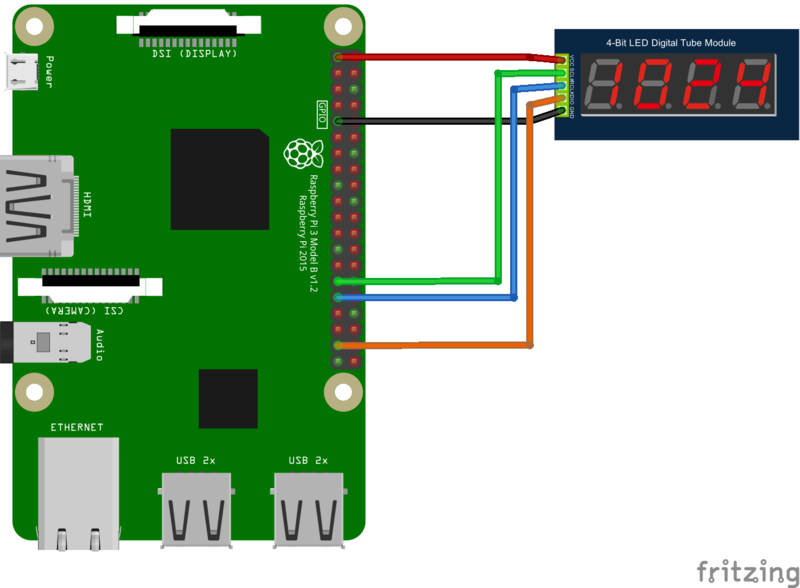 SCLK to gpio 5 (you can also change), RCLK to GPIO 06. Initiate GPIO Controller and Pins. C# translation of "void LED_OUT(unsigned char X)"
Now we can refact the logic of "void LED4_Display (void)". Create a new method, to display a single number on a particular tube. The index stands for different tubes from right to left. 0 is the 1st tube, 2 is the second, 3 is the third, 4 is the last. Because it is 4 digits, it can not excceed 9999, so remember to check the range. I didn't consider the nagetive numbers, so it will be 0-9999.
the number "8" is already defined in LEDDIGITS. In order to be easy to use, write a method, take int type number, then convert to byte to display. Then is the difficult part. How the LED Tube works is, by refreshing the characters on each tube for a very fast rate, human eye can not see the refresh, it will show like there are 4 digits at the same time. So that's why there are a while(1) loop in that C++ code. Translating to C#, in UWP, you will need a background worker so your app start page don't stuck.